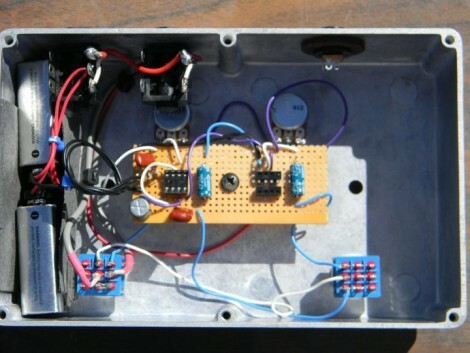 Rock in the new year with a guitar pedal you built yourself. [Doug Kovach] took the time to share his project with us in the video after the break. He starts with a bit of history of the artists that have used fuzz pedals similar to this one. It seems great guitarists have been hacking since way back. [Doug’s] rendition uses the warm sounds of germanium transistors in a design that produces professional results. But if you need something a little bit less serious try the stomp-box. This is a video of [Joey Mariano] from animal style demoing his Game Boy pedal board. He added a D15 port to the back of the Game Boy, which is wired to each of the 8 buttons. The port is connected to a breakout box for 8 piano sustain pedals. The box also provides power to the Game Boy. The Game Boy is running the Nanoloop step sequencer. If you’re wondering about the guitar sound, he’s probably using an 8-Bit Fuzz pedal.